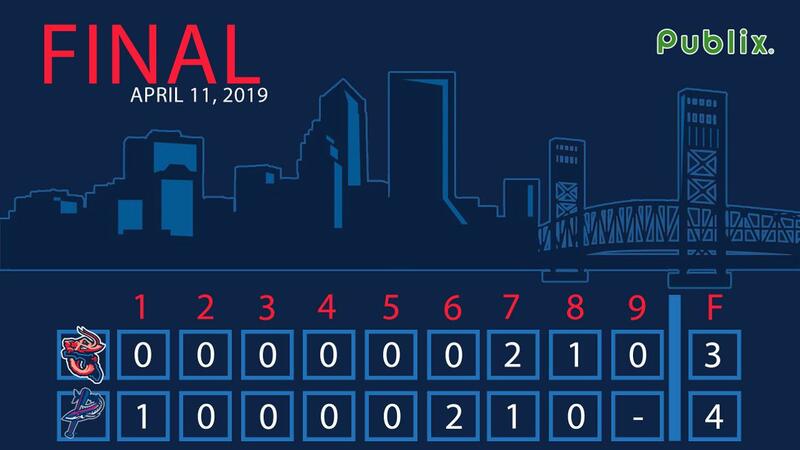 PENSACOLA, Fla. - The Jacksonville Jumbo Shrimp (3-4) fell to the Pensacola Blue Wahoos (5-2) by a 4-3 score in the second game of the five-game series at Blue Wahoos Stadium on Thursday night. Pensacola right-handed starting pitcher Brusdar Graterol (1-0) earned the win, pitching five and two-thirds scoreless innings allowing three hits with three walks and four strikeouts. Jacksonville right-handed starting pitcher Robert Dugger (0-1) took the loss, allowing a run on two hits. Dugger faced only two batters before he was taken out of the game due to injury, being struck on the right arm by a comeback line drive on a single by Luis Arraez. Pensacola right-handed relief pitcher Dusten Knight earned his second save of the season by working the final two innings. Jacksonville got on the scoreboard with two outs in the top of the seventh. Magneuris Sierra hit an RBI single to left field to score Rodrigo Vigil, then a throwing error by Wahoos left fielder Ernie De La Trinidad brought home Anfernee Seymour to make it a 3-2 game. The Wahoos got a run back in the bottom of the seventh, when a throwing error by Jacksonville left-handed relief pitcher Jeff Kinley on a pickoff attempt scored Jordan Gore from third to put the score at 4-2. Justin Twine led off Jacksonville's top of the eighth with a triple, then two batters later Joe Dunand brought him home on an RBI groundout to third to make it a 4-3 game, which would be the final. The Jumbo Shrimp and Blue Wahoos will continue their series with the third game of the five-game set on Friday night at 7:35 p.m. eastern. Right-handed pitcher Jorge Guzman (0-0, 1.80 ERA) will start for Jacksonville against Pensacola left-handed pitcher Devin Smeltzer (1-0, 0.00 ERA). Fans can listen to the game on the Jumbo Shrimp Network presented by Community First, beginning at 7:20 p.m. with the pregame show "Shrimp On Deck" locally on Sunny 102.3 FM, on the TuneIn Radio app, and www.jaxshrimp.com.